Microsoft is on track in its development efforts for delivering SharePoint Server 2016 next year, the company said during this week’s Ignite conference in Chicago. While Microsoft has been developing the product based on its cloud learnings, namely SharePoint Online as part of its Office 365 services, those cloud-inspired features eventually will make their way back into the server product. The capabilities that don’t make it into the server will be offered as Office 365 services that can be leveraged by premises-based systems. According to a chart presented during an Ignite session, Microsoft plans to deliver a public beta of SharePoint Server 2016 in the fourth quarter of this year. The product is planned for “general availability” release in the second quarter of 2016, but a “release candidate” version will precede that final product. It’s possible that the Q4 preview date is a worst-case milestone, though. Bill Baer, senior technical product manager and Microsoft Certified Master for SharePoint, said that the SharePoint Server 2016 public preview would appear “later this summer”. Microsoft is continuing to focus on SharePoint’s Files, Content Management, Sites and Portals components going forward. It plans to make it easier to use hybrid architectures (SharePoint Server plus Office 365 services) and make it easier for organizations to perform migrations when they are ready, according to Seth Patton, global senior director for SharePoint and OneDrive product marketing, in the “Evolution of SharePoint” Ignite session. Microsoft is adding new experiences to SharePoint that are based on making it more social and mobile, as well as being capable of leveraging machine learning capabilities, he added. One example is a new About Me next-generation portal coming to SharePoint Server 2016. 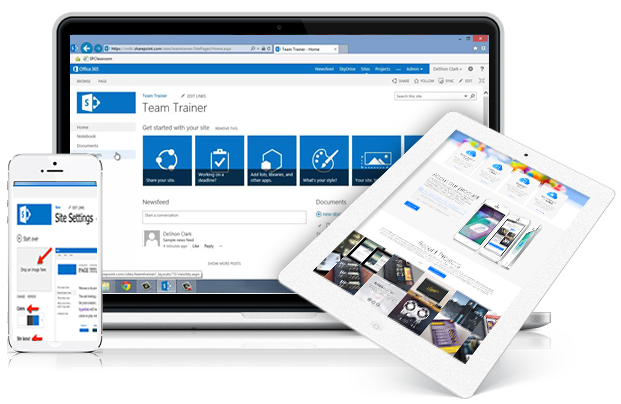 It uses Microsoft’s Delve content discovery tool, based on Office Graph enterprise search technology, to surface content and organizational information. Microsoft is also planning to ship an upgrade to SharePoint Server 2013 that will enable the Delve portal for those organizations that can’t wait for the release of SharePoint Server 2016. Microsoft is also working to make OneDrive for Business more viable for organizations, particularly on the mobile front. “OneDrive for Business isn’t where we want it to be,” Baer admitted during the Ignite session. Microsoft is improving the lightweight file sharing capabilities of OneDrive for Business while also improving SharePoint Server’s file sharing capabilities, he added. SharePoint traditionally has been a “role-agnostic operation,” but because of the variability of the product, it has been difficult to patch, Baer said. To ease matters, Microsoft will be adding a new server role installation wizard to SharePoint Server 2016. Microsoft also has added compliance reporting in SharePoint Server 2016 to help with role installations in the new product, Baer said. He commented that organizations will no longer have to pore through 15 pages of PowerShell commands to perform hybrid installations. Microsoft will have a new “MinRole” capability in SharePoint Server 2016 that will reduce it to hosting three discreet roles, including “user roles,” “robot services roles” and “cache services roles,” Baer explained in the “What’s New for IT Professionals in SharePoint Server 2016” Ignite session, which is available on demand here. Those organizations that don’t want the MinRole configuration can select a “specialized load” role option. MinRole is expected to make it easier to scale operations, he explained. SharePoint Server 2016 will have a built-in health analyzer that ensures that the roles will stay as provisioned in a SharePoint farm. It will scan everything for compliance, except for specialized loads. Baer explained that the health analyzer will compare the farm’s service instances to what Microsoft expects them to be and will report if they are compliant with Microsoft’s topologies. Microsoft will include a new fix button in the central administration console that will allow organizations to address instances when a server is out of compliance. SharePoint Server 2016 will require Windows Server 2012 R2 or “Windows Server 10,” Baer explained. It also requires Windows Server AppFabric 1.1, which Microsoft announced will be deprecated next year, but Baer said it will still be supported in SharePoint Server 2016. It’s possible to migrate or upgrade to SharePoint Server 2016. However, Baer added that it will not be possible to upgrade directly from SharePoint 2010 to SharePoint 2016. Microsoft has decided that SharePoint Server 2013 will be the “stepping stone” to SharePoint Server 2016. The 2013 version is considered to be the genesis block for future SharePoint versions and it has parity with SharePoint Server 2016, Baer said. When upgrading, any site collections will need to be brought up to the SharePoint Server 2013 mode first, he explained. Baer added some good news associated SharePoint Server 2016. Microsoft will be expanding the content database size, site collections per database, list threshold size, maximum file size and number of indexed items.